Contingency plan. Business notebooks don't have to be expensive, as we've seen in the past. 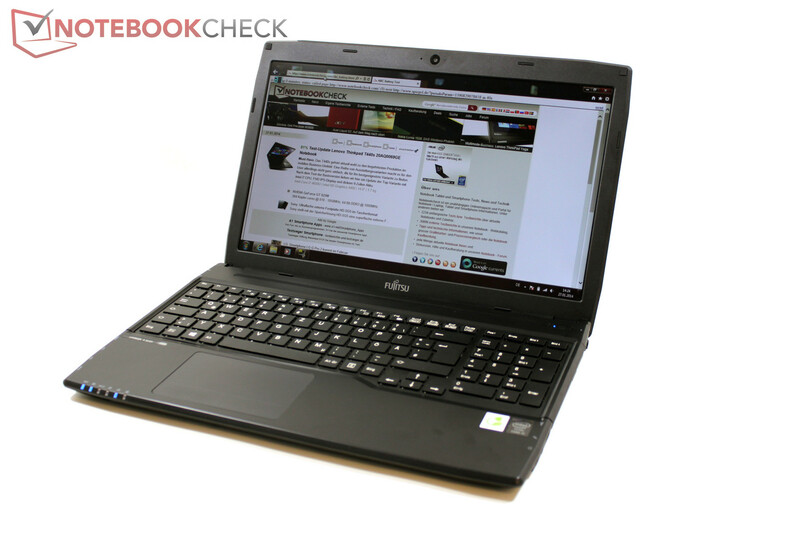 Fujitsu tries to gain a foothold in the lower price bracket with the Lifebook A544. How successful is the new notebook? It doesn't matter if it's a basic notebook for the first business venture or a workhorse for the University: inexpensive business notebooks designed to handle daily office-type tasks can be used in many different environments. The most important criteria in this class is first and foremost the price, as 50 Euro (~$65) up or down can influence the prospective buyer's decision, even if compromises as far as the hardware and the features have to be made. 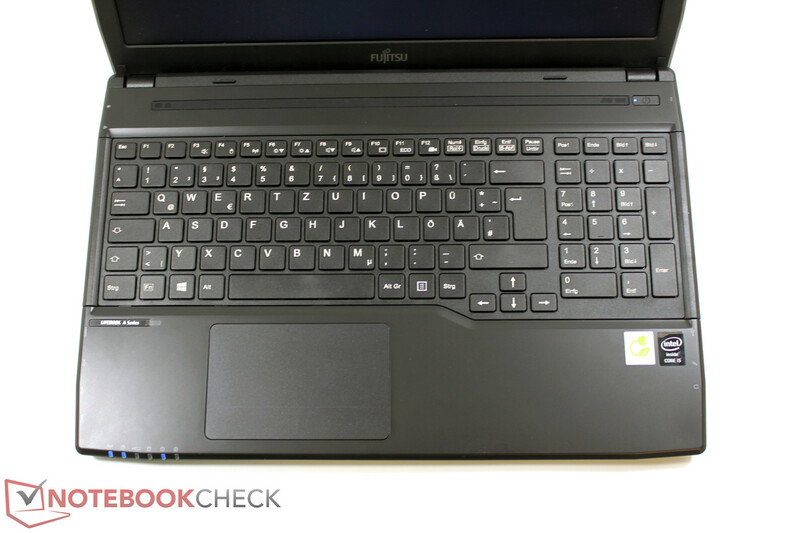 At the time of writing, the Fujitsu Lifebook is available through various online retailers and comes equipped with Haswell processors ranging from the i3-4000M up to the i5-4200M, RAM from 4 to 8 GB, and hard drives between 500 and 1000 GB. The price for our review notebook starts at 590 Euro (~$800). Alternatives are the previously reviewed Lenovo B5400 (i5-4200M, GT 720M, 8 GB RAM, 1000 GB HDD, about 550 Euro / ~$750) or the HP ProBook 455 (AMD A4-4300M, 7420G, 4 GB RAM, 500 GB HDD, approximately 500 Euro / ~$680). The Lifebook A544 is an all matte-black 15.6-inch notebook clad entirely in plastic. Haptics are OK, although the parts and materials don't convey an overly high-end feeling, partly because the base unit isn't very sturdy to begin with. Torsional rigidity is low and the surface areas give to pressure easily. The lid is also easy to twist, but the build quality is decent overall with no obvious shortcomings. The restricted travel range of the display lid is immediately apparent; the resulting maximum opening angle is about 120 degrees. Taller users might run into issues here, especially since the viewing angle stability is low. All ports are located on the left and right edges towards the front of the notebook and clearly labeled up on top. While quite accessible, plugged in cables and devices can crowd the work space and get in the way of operations. The SD card reader is housed on the front edge and is somewhat hidden. According to the driver properties, Fujitsu uses an Intel Wireless-N 7260 (bgn) module. For some reason, we were unable to join the notebook to our network despite repeated attempts, so we finally had to resort to using a smartphone as a hotspot to establish a connection. Positive: both recovery media for Windows 7 as well as Windows 8.1 are included. Fujitsu touts a dedicated numeric keypad as one of the features of the keyboard, which can lead to improved entry speeds when working a lot with numbers. 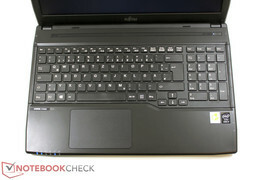 The layout itself is generous, since Fujitsu makes use of the entire width of the notebook. The keys are flat, have limited travel, but a clearly defined pressure point and decent feedback. The keyboard flexes towards the edges when pressure is applied. Especially during spirited typing sessions, we noticed unpleasant noises in this area, although normally the keyboard noise remains in the background. The touchpad is much less impressive. Although the surface of the pad itself is pleasant to work with, the left and right click zones repeatedly didn't respond at all or not as expected. Operation with both hands is sketchy at best. The HD display with a resolution of 1366 x 768 pixels also fails to impress. The marginal viewing angle stability in conjunction with the low opening angle lead to color changes even with the notebook placed on a desk. With the notebook below the normal visual axis, for example sitting on the user's lap, the situation gets much worse. In the horizontal plane, things are not as dire, but brightness decreases rapidly nonetheless. Speaking of the brightness: the average of about 200 nits is also far from stellar. The high black value of over one candela and the corresponding low contrast ratio of 199:1 also make for a rather dismal overall visual experience. Color accuracy of the panel Fujitsu uses for its Lifebook is par for the course: DeltaE(2000) deviations of 6.77 for ColorChecker and 6.82 for Grayscale compared to the ideal values of the sRGB color space are already visible with the naked eye. Although very high color accuracy is normally only important to graphic artists, even regular users will have to contend with the visible bluish cast of the display panel. The matte display panel prevents unwanted reflections when outdoors, but the low brightness - which at least doesn't drop when the notebook is running on battery power - diminishes usability in bright environments substantially. 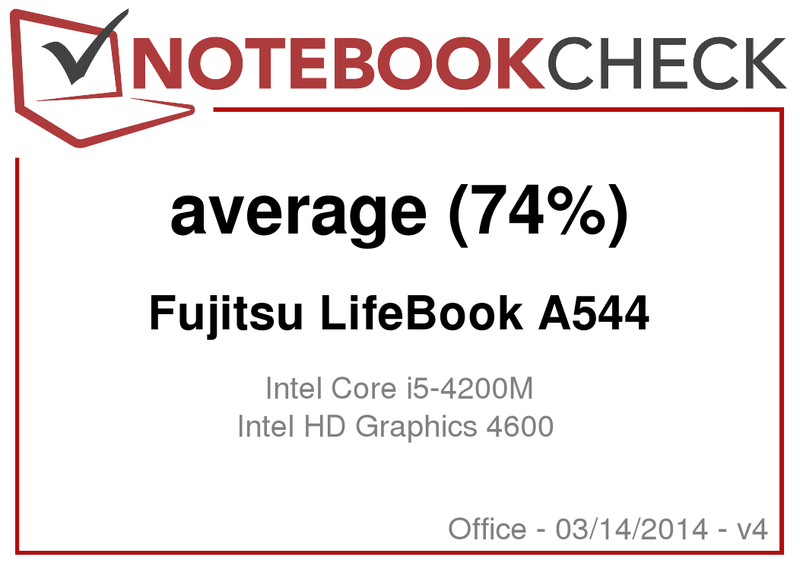 Equipped with either Intel Core i3 or i5 processors, the Fujitsu Lifebook A544 is decidedly not entry level when it comes to CPU performance. Our review notebook shipped with the i5-4200M, which supports clock speeds from 2.5 to 3.1 GHz (2 cores, 4 threads), and makes quick work of CPU-intensive tasks. The amount of RAM - Fujitsu offers 4 and 8 GB - depends on the proposed workload. The 8 GB version should have an advantage, since the RAM runs in dual-channel mode, which in turn increases the performance of the integrated Intel HD Graphics 4600. The spec sheet also lists the Intel 4702-MQ as an option. This quad-core CPU should increase the performance of any software which can take advantage of the additional cores. For less demanding applications, like word processing, web surfing, or simple spreadsheet calculations, even the lower-end Intel Core i3 should be more than sufficient. We evaluate the performance of the i5-4200M with the Cinebench R11.5 benchmark tool. The CPU performed as expected - and much like in other, similarly equipped notebooks - during the single-core rendering test. The i3-4000M is slower by about 20 %; the 4702MQ is only marginally faster. The ULV version of the i5-4200M, the i5-4200U, trails by about 15 %. The multi-core rendering test result is also in line with our expectations. The i3-4000M is again slower by about 15 %, while the 4702MQ quad-core CPU pulls ahead by up to 100 % - at least for optimized applications. The AMD APU A4-4300M in the ProBook 455 is slower by about 50-70 %, depending on the test. The Lenovos B5400 scored almost identical, which isn't really a surprise since it is equipped with the same CPU. The clock speeds of the i5-4200M are close to ideal during the various test scenarios. During the OpenGL test, for example, the HD Graphics 4600 GPU maintained a constant 1150 MHz, while the CPU fluctuated between 3.0 and 3.1 GHz during the single-core test and remained at 3.0 GHz during the multi-core test. In all cases, Turbo Boost is working at the uppermost limit. Since the whole system can only be as strong as the weakest link, we use the very comprehensive PCMark 8 to determine overall system performance based on various productivity sub-tests. The score of 3207 points in the Home test exceeds our expectations significantly, since even some dedicated multimedia machines like the Dell XPS 15 (4702HQ, GT 750M, SSD) don't score any better. The CPU, which runs at maximum Turbo Boost speed at all times, is most likely the reason for the good result. Our experience with the notebook during our time with it did not quite reflect the benchmark results, however. Quite frequently, we had to deal with long wait times when installing applications or when starting programs. The most likely culprit: the HDD. The 500 GB HDD installed in our review notebook is the lowest-end configuration. HDDs with up to one Terabyte are available, although the rotational speed remains at 5400 RPM. The results of the CrystalDiskMark benchmark test show fairly low transfer speeds for both the 4k read and write tests, even when compared to other conventional hard drives. The access time is also nothing to get too excited about. A faster hard drive would improve the results; upgrading to a Solid State Drive would be even better. The problem is not the procedure itself (the maintenance hatch allows access to the RAM, wireless module, HDD, fan, and the heat sink) but the cost: a model with 250 GB will set the user back 100 to 150 Euro (~$130-200). All versions of the notebook make use of the integrated Intel HD Graphics 4600. The integrated chip is designed for basic functionality and includes decoder units for HD videos. If gaming is high on the agenda, it would be advisable to purchase a notebook with dedicated graphics instead. 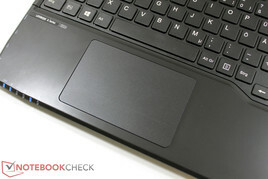 The Lenovo B5400 is one of the notebooks fitting the bill. The results of the 3DMark 2013 benchmark test place the Lifebook A544 more towards the lower end of the spectrum when compared to other notebooks based on the same HD 4600 GPU. Lenovo's B5400 didn't outperform the Lifebook by much despite the GT 720M GPU; HP's ProBook 455 with integrated AMD GPU scored a lot lower. The results of the 3DMark tests are not always an indicator for the actual gaming performance, as we've seen when we reviewed the Lenovo B5400. Depending on the game, the GT 720M can offer up to 50 % more performance than the integrated Intel GPU. Since the Fujitsu A544 doesn't have a dedicated GPU, only games with low power requirements are playable at all. Examples are classic games like Fifa 14, Starcraft 2, Diablo 3, Anno 2070, and others. With the details set to low, these familiar-sounding older titles can be a fun way to pass some time. With the "Balanced" profile active and under low load, the A544 remains mostly silent, although the fan activates once in a while for a few seconds with an audible whooshing sound. The HDD activity is also audible. Under heavy load, the notebook is far from quiet. Subjected to medium-heavy loads (3DMark 2006), the notebook reaches 38.1 dB(A). The stress test, which simulates maximum load, pegged our meter at 47.5 dB(A). That noise level can be attributed to the fact that the Turbo Boost is always active: during the stress test and maximum utilization of processor and graphics, we saw frequencies of 2.6-2.7 GHz for the CPU and the maximum of 1150 MHz for the GPU. The temperature of the chip stabilized at around 80 degrees C.
Although the chassis of the Lifebook A544 remains pleasantly cool during idle and undemanding office tasks, we noticed a hotspot near the fan exhaust at the bottom when we subjected the notebook to higher, prolonged loads. This is not an issue as long as the notebook is used on the desk when tackling power-intensive workloads. (±) The average temperature for the upper side under maximal load is 32.4 °C / 90 F, compared to the average of 29.4 °C / 85 F for the devices in the class Office. (±) The maximum temperature on the upper side is 40.4 °C / 105 F, compared to the average of 33.9 °C / 93 F, ranging from 21.2 to 62.5 °C for the class Office. (+) The palmrests and touchpad are reaching skin temperature as a maximum (32.6 °C / 90.7 F) and are therefore not hot. (-) The average temperature of the palmrest area of similar devices was 28.2 °C / 82.8 F (-4.4 °C / -7.9 F). The integrated stereo speakers unfortunately don't sound that great, which is pretty common in this price class, however. Although they maximum volume is certainly loud enough, the sound remains tinny and flat. Business customers probably won't mind and use headphones to improve the sound experience. With power requirements from 5.4 to 8.2 watts during idle, the Lifebook A544 requires slightly less power than the Lenovo B5400. 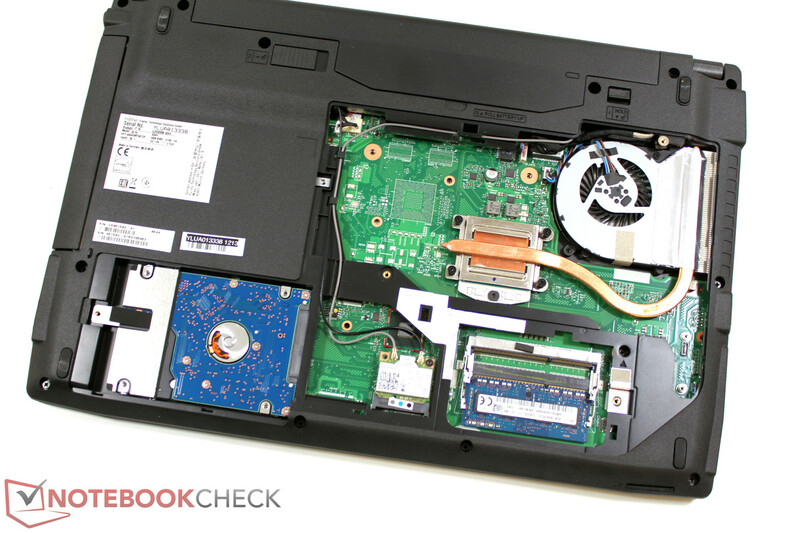 The ProBook 455 is more power-hungry than our review model, even though it offers less performance. Under load, we recorded between 42.2 (mixed load) and 54.4 watts (absolute maximum during the stress test). The Lenovo B5400 needs significantly more because of the dedicated GT 720M graphics card, which becomes active when the load increases. HP's ProBook 455 is based on AMD architecture and much more frugal, but also offers less performance. The Lifebook ships with a 49 Wh battery - similar in capacity to batteries used in competing notebooks. The Lenovo B5400 lasted about three hours during the WLAN test, while the ProBook 455 did much better here with almost 4.5 hours. 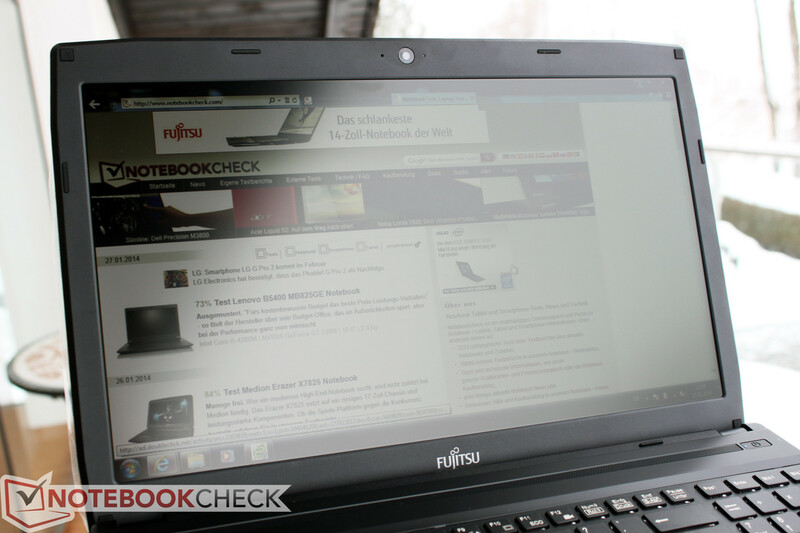 The Fujitsu Lifebook A544 outclassed both competitors and kept running for almost 7 hours during the same test (with the screen brightness set to 150 cd/m², a script loads a new webpage every 40 seconds). Depending on the energy saving measures taken, the notebook could foreseeably last the entire workday. Just how much "business" can the prospective buyer expect to purchase for less than 600 Euro (~$800)? Compromises are necessary as far as the chassis and the display are concerned: while the former is torsionally not very rigid, the latter can already be a limiting factor even when the user is sitting at a desk because of the restricted viewing angles. The port locations are less than ideal and a docking port isn't even offered. The keyboard offers a decent typing experience, but the touchpad didn't want to cooperate with us at times. 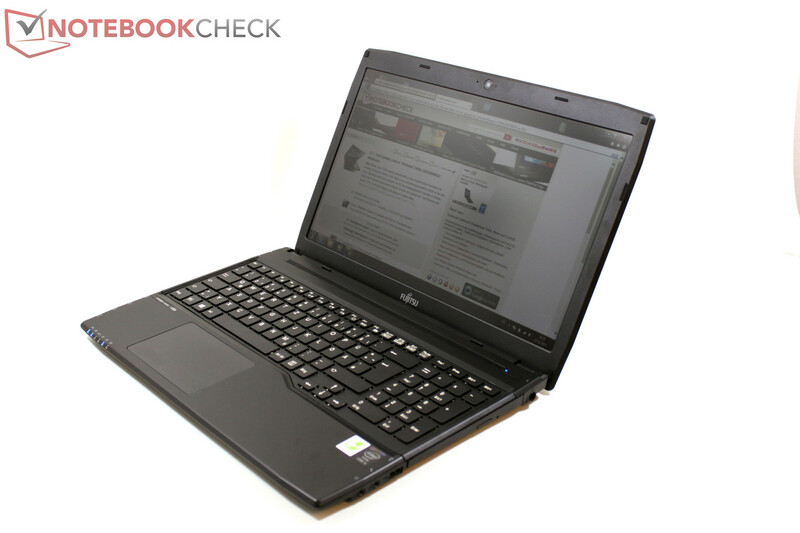 A positive surprise is the processor performance: Fujitsu uses the powerful i5-4200 for this particular Lifebook, so even CPU intensive applications pose no problem. The hard drive is a bottleneck and hampers the perceived performance. The fan control could be a bit more granular, although the roomy chassis definitely does not suffer from excessive temperatures. Nonetheless, we see lots of room for improvement as far as the precise adjustment of the the fan speed is concerned. The expected battery life of more than 6 hours is also noteworthy. The Lifebook A544 could be a very decent notebook for the road if only the quality of the display was up to par. The keyboard is a nice surprise and good enough so that even daily word processing tasks are not out of the question. A sturdier chassis, as it seems to not be really sufficiently strong to withstand the rigors of the road. The CPU performance is top notch, even under extreme load levels.